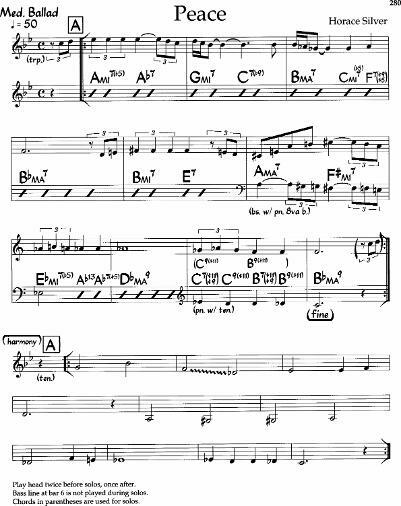 As a huge fan of Horace Silver I was interested in various takes on his best-known tune, "Peace." Not a fan of Nora Jones, though I appreciate the fact she's getting people to listen to better music than they otherwise might. I was interested in her take and I was amazed at the beautiful interpretation she gave it. Bingo. I dropped my bass onto the tune via the usual Sony Walkman using the Fender four fretless via an SWR 12". One take. Ms. Jones sings the tune in Ebmaj while the New Real Book II chart is in Bb maj.